You were probably too busy bashing some poor troll’s head in to notice the God of War runes that were scattered about Niflheim and the other Nine Realms. No, not the ones Atreus dusted off for a few measly XP. There are more: the ones peeking out from under rocks and even on the back of the game’s case. Thankfully, ardent fans have taken it upon themselves to translate them into English, and they reveal not only spoilers hidden in plain sight, but also a tantalizing tease for the franchise’s future. There’s Baldur, a walking tattoo if ever I’ve seen one and, what’s that, Reddit has found he’s got the word ‘cursed’ literally written all over him? We should’ve seen that big reveal coming, shouldn’t we? Trust me, it gets better. The God of War steelbook case (H/T GamesRadar+) may only appear to reveal the game’s synopsis, but it’s the ‘truth that is to come’ that is most compelling. 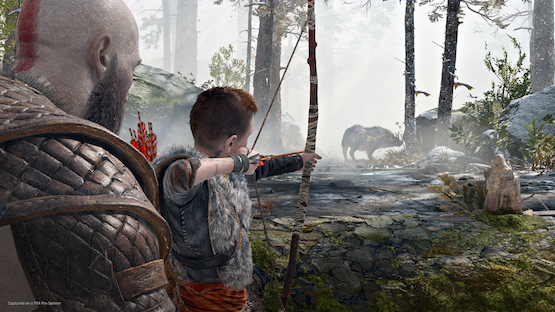 When coupled with the end-game mural depicting a future prophecy, Kratos is met with the words ‘death’, ‘father’ and, yep, ‘betrayal.’ Most interesting of all, the Ghost of Sparta can’t read the God of War runes staring him in the face, but his son certainly can. It’s a tragedy waiting to happen, I tell ya, and a father-son falling-out is going to be at the heart of it. Don’t blame me. Blame the runes.